The Portable Urn Display Rack Value Bundle by XL Industries Inc. is a complete portable urn display rack set that includes one Portable Urn Display Base Rack, one Urn Stand Floral Rack, one Urn Stand Portrait Mounting Set, and one Urn Stand Heavy-Duty Urn Shelf. Require elegance at a cremation ceremony? The Portable Urn Display Rack Value Bundle is an attractive set for use at cremation memorials providing the user with a portable, elegant display system. 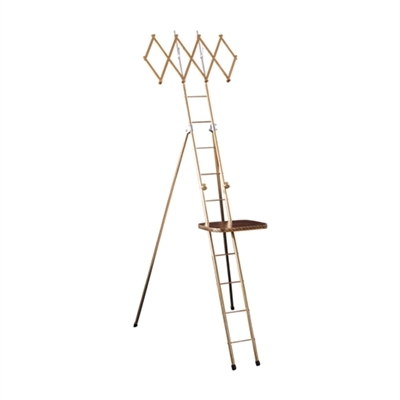 The stand is an adaptation of the XL Ladder Rack, featuring bright gold anodized aluminum tubing. The urn shelf is heavy duty & wood-grain finished, and can be attached to a variety of rung heights. It has a brass finish on the edge to match the bright gold finish of the stand. The floral rack, which easily inserts into the top of the stand, is constructed of gold anodized aluminum. It has steel points for mounting flower arrangements, which fold and lock out of sight when not in use. A portrait mounting set is included, made of polished brass knobs permitting a portrait display integral to the urn display. Will fit in the Carrying Case for 75" Ladder Rack Value Bundle.